Carl was born on January 14, 1948, in New Orleans, Louisiana. 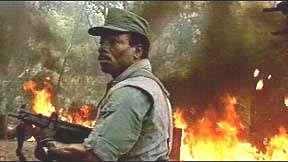 Carl Weathers is a famous and professionally successful football star at San Diego State (and later the Oakland Raiders), who retired from the sport in 1974. Played for the B.C. Lions of the Canadian Football League, from 1971 to 1973. Played linebacker in 18 games and wore #55. Carl's first real success came when he was chosen to play Apollo Creed, in the highly seen and applauded blockbuster movie, ROCKY (1976). In the early 1990s, Weathers starred in the syndicated TV action series, Street Justice, and briefly substituted for Howard E. Rollins on the series, In the Heat of the Night. Carl Weathers is also a member of the Big Brothers Association and the U.S. Olympic Committee, handling the career of Athletes of various sports – such as gymnastics, wrestling, swimming and judo.